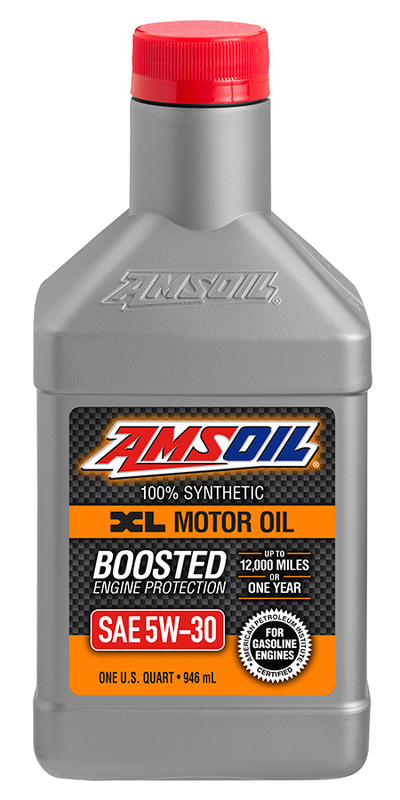 Signature Series 0W-40 Synthetic Motor Oil AMSOIL Signature Series Synthetic Motor Oil is engineered to outperform conventional and synthetic motor oils. It combines industry-premier synthetic technology with AMSOIL premium additives in a unique formulation that exceeds the higher performance demands of modern engines. Signature Series 10W-30 Synthetic Motor Oil is engineered to outperform conventional and synthetic motor oils. 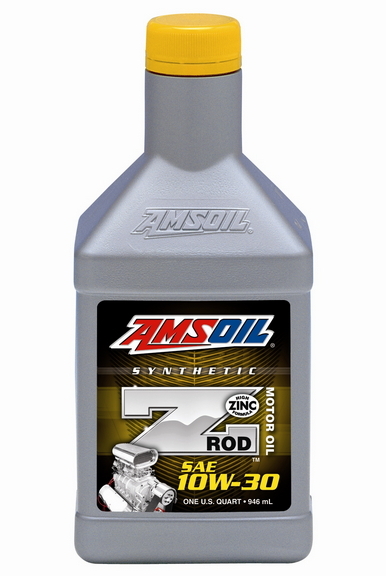 It combines industry-premier synthetic technology with AMSOIL premium additives in a unique formulation that exceeds the higher performance demands of modern engines. Signature Series 5W-50 Synthetic Motor Oil is engineered for Mustang Trac-Pack. It combines industry-premier synthetic technology with AMSOIL premium additives in a unique formulation that exceeds the higher performance demands of modern engines. XL 0W-20 Synthetic Motor Oil Extended-Drain Boost Technology Formulated for up to 10,000-miles/six month intervals, or longer when recommended in owners’ manuals or indicated by oil monitoring systems. 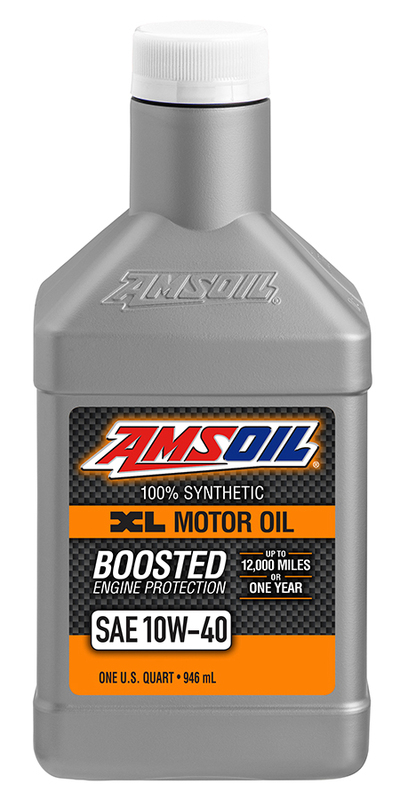 XL 5W-20 Synthetic Motor Oil Extended-Drain Boost Technology Formulated for up to 10,000-miles/six month intervals, or longer when recommended in owners’ manuals or indicated by oil monitoring systems. XL 5W-30 Synthetic Motor Oil Extended-Drain Boost Technology Formulated for up to 10,000-miles/six month intervals, or longer when recommended in owners’ manuals or indicated by oil monitoring systems. XL 10W-30 Synthetic Motor Oil Extended-Drain Boost Technology Formulated for up to 10,000-miles/six month intervals, or longer when recommended in owners’ manuals or indicated by oil monitoring systems. XL 10W-40 Synthetic Motor Oil Extended-Drain Boost Technology Formulated for up to 10,000-miles/six month intervals, or longer when recommended in owners’ manuals or indicated by oil monitoring systems. Provides better wear control, high- and low-temperature protection and increased fuel economy compared to conventional oils. AMSOIL OE 0W20 Synthetic Motor Oil is specially formulated for the longer oil change intervals recommended by vehicle manufacturers today. Its advanced synthetic technology resists chemical breakdown for maximum wear protection (and peace of mind) well beyond the traditional 3,000-mile oil change interval. OE 5W-20 Synthetic Motor Oil Formulated for Excellent Engine Protection and Performance AMSOIL OE Synthetic Motor Oil is specially formulated for the longer oil change intervals recommended by vehicle manufacturers today. Its advanced synthetic technology resists chemical breakdown for maximum wear protection (and peace of mind) well beyond the traditional 3,000-mile oil change interval. 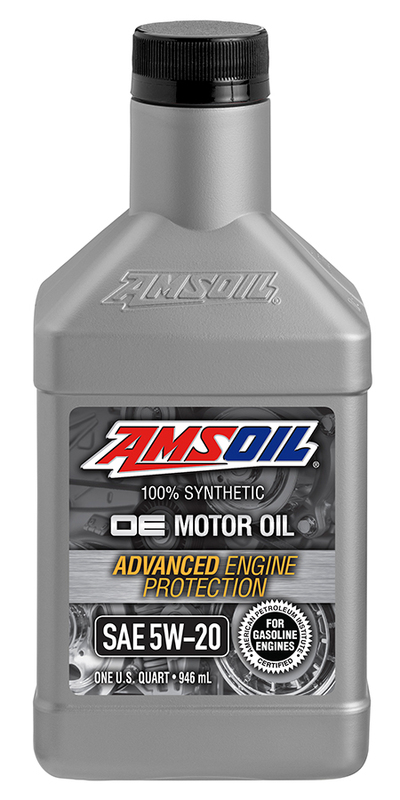 OE 5W-30 Synthetic Motor Oil Formulated for Excellent Engine Protection and Performance AMSOIL OE Synthetic Motor Oil is specially formulated for the longer oil change intervals recommended by vehicle manufacturers today. Its advanced synthetic technology resists chemical breakdown for maximum wear protection (and peace of mind) well beyond the traditional 3,000-mile oil change interval. 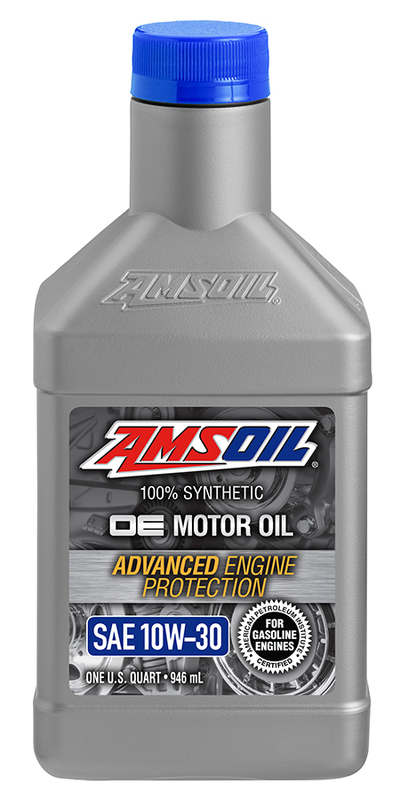 OE 10W-30 Synthetic Motor Oil Formulated for Excellent Engine Protection and Performance AMSOIL OE Synthetic Motor Oil is specially formulated for the longer oil change intervals recommended by vehicle manufacturers today. Its advanced synthetic technology resists chemical breakdown for maximum wear protection (and peace of mind) well beyond the traditional 3,000-mile oil change interval. Z-ROD® 10W-30 Synthetic Motor Oil Modern Technology For Classic Cars AMSOIL Z-ROD Synthetic Motor Oil is specially engineered for classic and high-performance vehicles. A high-zinc formulation to prevent wear on flat-tappet camshafts and other critical engine components, along with a proprietary blend of rust and corrosion inhibitors for added protection during long-term storage. 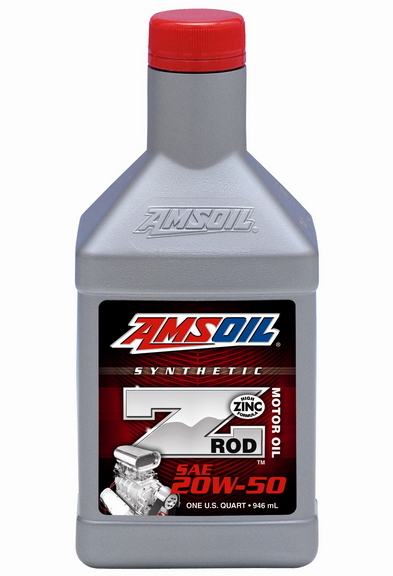 Z-ROD® 20W-50 Synthetic Motor Oil Modern Technology For Classic Cars AMSOIL Z-ROD Synthetic Motor Oil is specially engineered for classic and high-performance vehicles. A high-zinc formulation to prevent wear on flat-tappet camshafts and other critical engine components, along with a proprietary blend of rust and corrosion inhibitors for added protection during long-term storage. 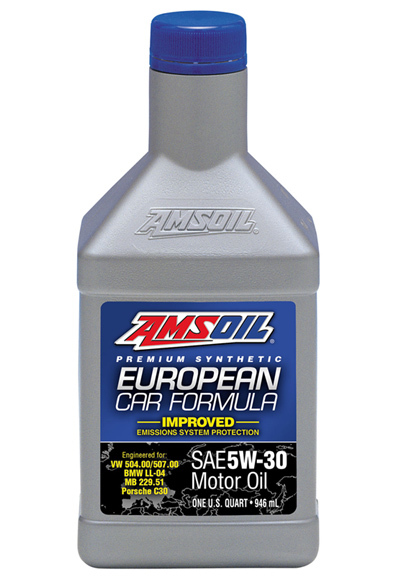 European Car Formula 5W-30 Low-SAPS Synthetic Motor Oil Low-SAPS, Low-Viscosity European Oil for European Gasoline and Diesel Engines AMSOIL European Car Formula 5W-30 Low-SAPS Synthetic Motor Oil provides exceptional performance and protection for high-performance European vehicles. Its low-viscosity formulation maximizes fuel efficiency. 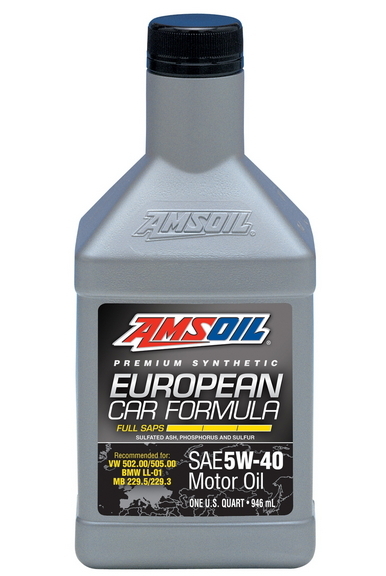 European Car Formula 5W-40 Mid-SAPS Synthetic Motor Oil Mid-SAPS European Oil for European Gasoline and Diesel Engines Formulated for the lubrication needs of modern European gasoline and diesel cars and light trucks. Its mid sulfated ash, phosphorus and sulfur (SAPS) formulation provides excellent protection for emissions systems. 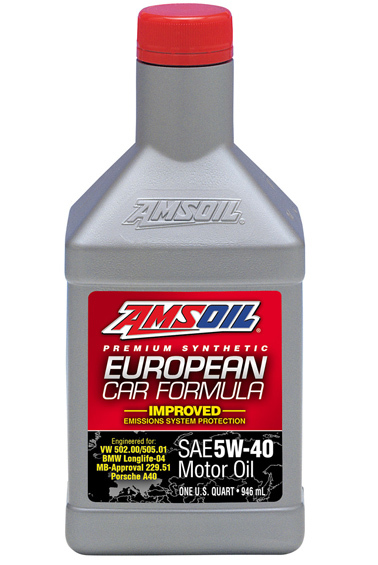 European Car Formula 5W-40 Full-SAPS Synthetic Motor Oil Full-SAPS European Oil for European Gasoline and Diesel Engines Formulated for the lubrication needs of European gasoline and diesel cars and light trucks. Its full sulfated ash, phosphorus and sulfur (SAPS) formulation provides excellent protection and performance for a wide range of vehicles.